Providers will capitalize on healthy IT budgets and customer readiness to adopt cloud solutions. UCaaS providers typically see their growth opportunities in migrating customers with premises-based solutions to cloud communications. However, customer churn among UCaaS providers is bad news for some and good news for others. 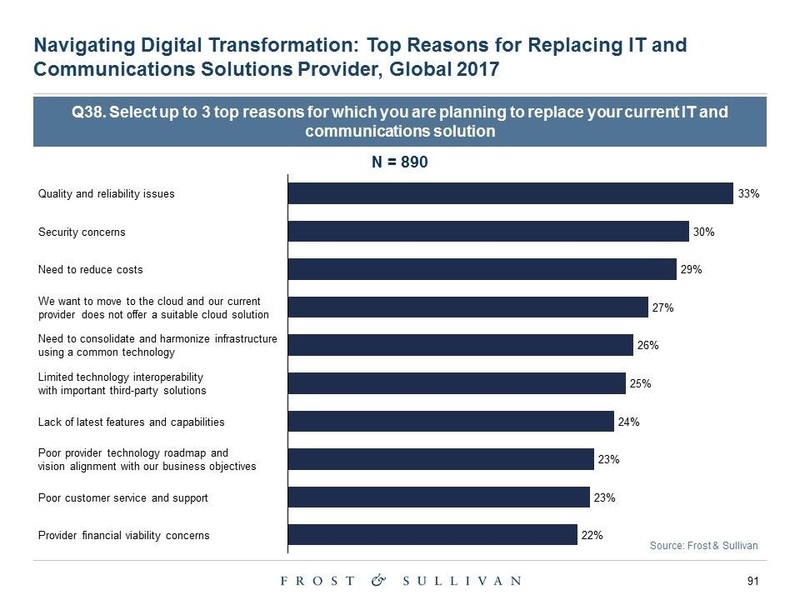 Frost & Sullivan research shows that a significant 46% of global investment decision makers plan to replace their IT or communications providers in 2018 and 2019. Cyber security, big data and analytics, and Internet of Things (IoT) vendors face the biggest threat and opportunity with 39%, 38%, and 34% of respondents planning to replace their vendors for the respective solutions/technologies. Premises-based UC vendors and UCaaS providers are not safe either -- 26% of respondents are looking to replace their communications providers. Solution quality and reliability issues rank highest among customer churn factors, selected by 33% of those looking to replace providers. Quite important for UCaaS providers, 27% of respondents in this group are switching providers because they want to move to the cloud and their current provider does not offer a suitable cloud solution. Overall, these data indicate a considerable opportunity for providers of cloud-based security, big data, analytics, IoT, and communications solutions. UCaaS providers must carefully evaluate their customers' and prospects' cloud perceptions and provider selection criteria to stay competitive and accelerate growth rates. As the market becomes increasingly competitive, UCaaS providers will need to more effectively address key customer concerns to win deals. Security and reliability top the list of cloud communications provider selection criteria with 45% and 40% of respondents identifying these as their key decision-making factors. Price and cutting-edge features are neck-in-neck in third and fourth positions. The UCaaS market continues to grow rapidly and is already entering the mainstream adoption stage. However, businesses adopting cloud solutions will scrutinize providers and solutions based on a variety of criteria. Owning the right UCaaS tool set, an effective go-to-market strategy, and an appropriate marketing message will be critical for provider success. An End User Perspective on Workplace Communications and Collaboration, Global, 2017. Also, consider attending Decision Factors in Choosing a UCaaS Provider next Monday, March 12, at Enterprise Connect 2018.